Testimony from a volunteer of the Mong Kok Community Solidarity group - We will hold on together with the people. Ms. Lam is a social worker who worked in a non-governmental organisation. She had been spending her last few days in Mong Kok, volunteering for marshalling the occupied zone in Mong Kok. She arrived Mong Kok occupied zone at around 3pm today after finishing her marshalling shift yesterday at mid-night. When she arrived the HSBC building in Mong Kok, it was already a chaotic scene. 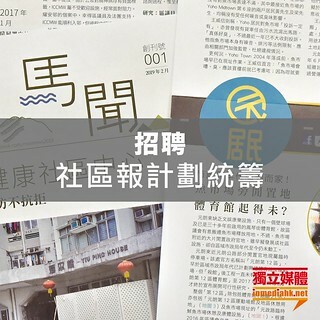 There was a group of “anti-Occupy protesters" who were wearing blue-ribbon “in support for the police”. They surrounded the main stage in the occupied zone and forcibly removing the tent set up by the occupiers. They removed the canvas and the metal frames of the tents, which worried a lot of occupying protesters. The “anti-Occupy protesters" were very emotional and kept yelling at the occupying activists, deliberately provoking the crowds there. Ms. Lam witnessed an “anti-Occupy” man pushed another person on the ground. The occupying activists were very worried about their own safety and also concerned that the metal frames would be hurting others. Therefore, a group of students and volunteers of some grassroots organisations were trying to surround the damaged tent in order to prevent hazards to the public. According to Ms. Lam, the students and some female protesters turned emotional. Some were crying and could not understand why they were treated like this just for protesting peacefully. Everyone were worried about their safety and also that of the others. As more “anti-Occupy protesters” moved in towards the HSBC building, the situation became dire. Ms. Lam received a lot of messages from her friends saying that Mong Kok was very dangerous now, and asking her to leave. At the same time, she was told that a pro-government group “Caring Hong Kong Power” had started mobilising on the internet asking “anti-Occupy protesters” to “forcibly disperse” the occupying crowd at 6pm in Mong Kok. Between 6pm & 7pm, the number of “anti-Occupy protesters” kept increasing and the situation to the occupying activists were more and more threatening. Ms. Lam said that those “anti-Occupy protesters” were very aggressive and were yelling and throwing water bottles at the occupying activists. Some of the occupying crowd was really worried and Ms. Lam and others started to ask whether they would like to stay or leave. Some chose to stay while some preferred to go to support in Admiralty - but worried that as they left, the smaller crowd would be in even greater danger. As there was insufficient police on the scene, the situation almost got out of control. There was volunteer who lent a loudspeaker to the police so that the latter can better control the crowd. At the end, about dozens of occupying activists were escorted out of the scene by the police. Later, there were police issuing warning to the still-occupying activists, accusing them of causing dangers because of their gathering, and that they will be arrested if they refuse to leave. The occupying crowd was angered as they did not understand why victims of violence would suddenly become dangerous while the perpetrator of those violent acts were not even warned. They felt that the police treatment of them was unfair and that they should keep on staying in Mong Kok. The mood was very tense, and violence can be exploding at any second. Each one in the crowd was being asked whether they wanted to stay or not and most of them decided to stay. Ms. Lam and her friends in the volunteer team therefore decided to stay as well. A while later, police negotiators arrived but were not helpful at all. Ms. Lam said the volunteer team in the occupied zone consisted of a number of workers at non-governmental organisations, social workers, first-aiders and nurses. They thought that all participating citizens in the occupying movement had a strong will to keep on fighting for democracy. And that is why the team had decided to hold on together with the people - to stay in the Mong Kok occupied zone and also facilitate the exchange of news and information.